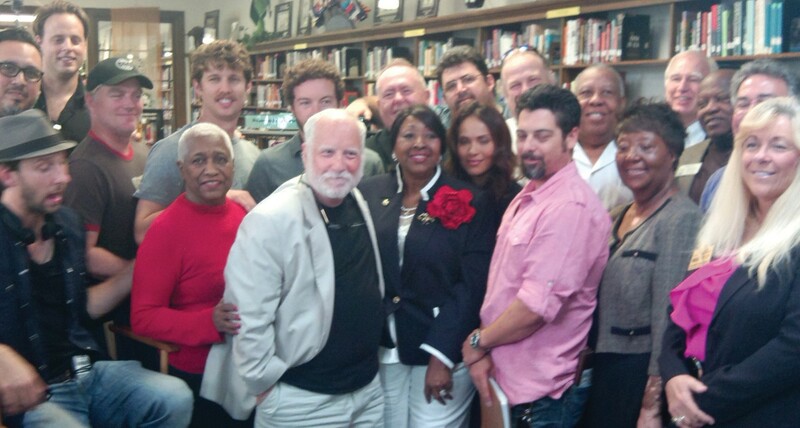 Mayor Edna Jackson, members of the city council, the Chatham County Commission and State Rep. J. Craig Gordon met with Academy Award winning Actor Richard Dreyfuss, Filmmaker Albert Sandoval of RadioactiveGiant and his film crew Thursday to discuss the importance of hiring unionized labor when they make films in Savannah. The elected officials were invited to the set of “Killing Winston Jones” by Brett A. Hulme, president of the Savannah Regional Central Labor Council. Dreyfuss and RadioactiveGiant spent the past month in Savannah filming the “Killing Winston Jones” at the Savannah Arts Academy. Actor Danny Glover is also starring the “laugh out loud comedy,’’ said Sandoval. Sandoval and his partner Tom Somerset said they’re considering making other films here. And if they do that Mayor Edna Jackson said the company should hire local union workers. “In this country, if you manage to get here. You can try and you can fail. We are labor. We are unions. If we don’t remember that we are deliberately disarming ourselves,’’ Dreyfuss said. Dreyfuss said the movie “Killing Winston Jones” is about two gym teachers, who dislike each other. But their bad feelings get worse as they vie to get a school gym named after them. When they learn that that kind of honor is generally given to people after they’re dead, the two men spend the rest of the movie trying to die. Tina A. Brown is a freelance journalist based in Savannah.